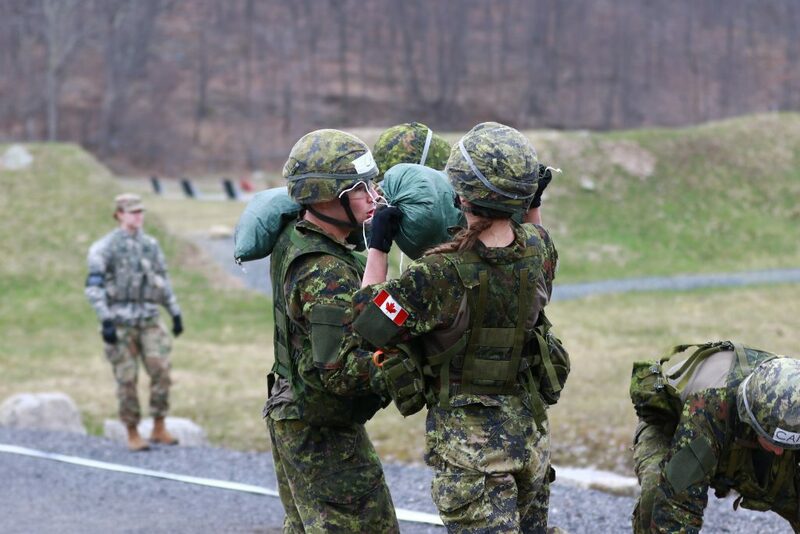 This past weekend, the Royal Military College’s Sandhurst Team travelled down to the United States Military Academy, West Point for the 2019 Sandhurst Competition. 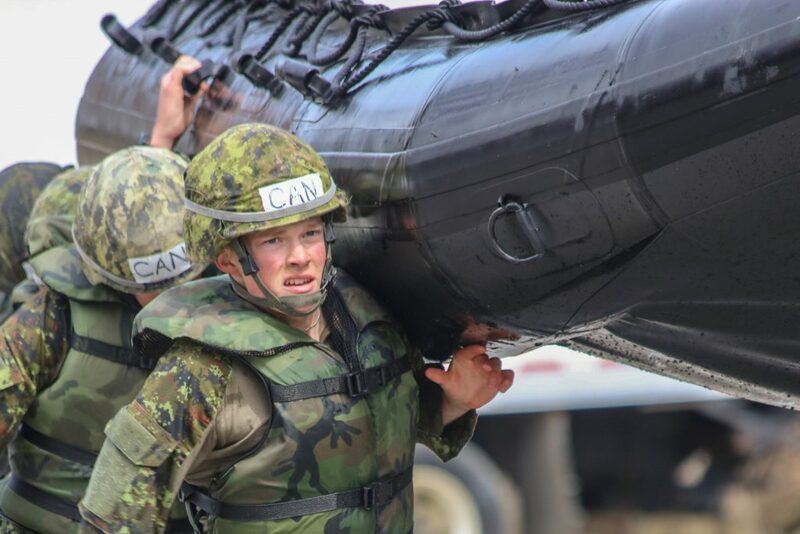 The team consisted of 11 Officer Cadets who had to take on the long and grueling obstacle course that tested everything they had been working on over the course of the last year. I had the opportunity to travel to West Point as a member of the RMC Spirit Team; a group of 13 Officer Cadets who travelled to New York to cheer on the team. On top of us, 13 other family and friends of the Team showed up to wave Canadian Flags and cheer on the RMC Sandhurst Team. We arrived at West Point around 8:45am and ran to the starting point to see the RMC Team take off. At exactly 9:00am, the team ran to their first obstacle. 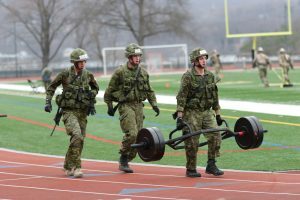 The competition started rough: the Team did a number of cardio endurance exercises that included sled pulling, carrying heavy weights across large distances, and “sprint”-style exercises. 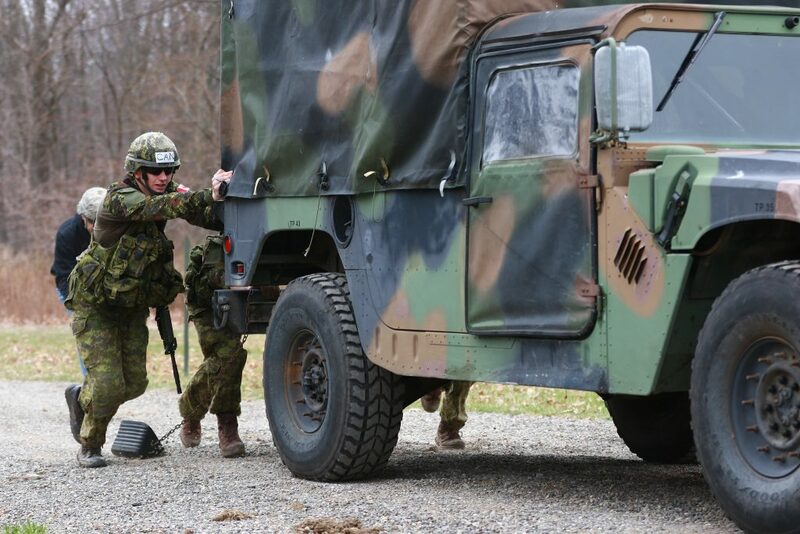 The second obstacle consisted of a truck pull over a distance of about 20m, as well as a pistol range that would test the Team’s ability to fire the handguns in three different positions: standing, kneeling, and prone. The Team then ran to the third obstacle, which consisted of sandbag carries, casualty drags, and an M203 Grenade Launcher range. RMC continued to show what they were capable of and embodied the warrior spirit, despite the cold and cloudy conditions. After about 20 minutes, the team rendezvoused and took off to the fourth obstacle. The sun started to break through the clouds when the Team arrived, giving some much-needed warmth. 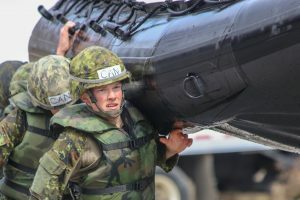 This obstacle consisted of carrying a zodiac boat into the cold water, paddling around some markers in the water, and a zodiac carry back to the starting point. At one moment, there was gunfire that indicated that two members must “jump-ship” into the water. Even this, however, didn’t slow down the team. At the end of the obstacle, the Cheer Team, as well as the family/friends that were present, sang the national anthem loud and proud for the team to hear. This was as far as we could watch. The team then completed a series of Land Nav exercises, both during the day and at night. 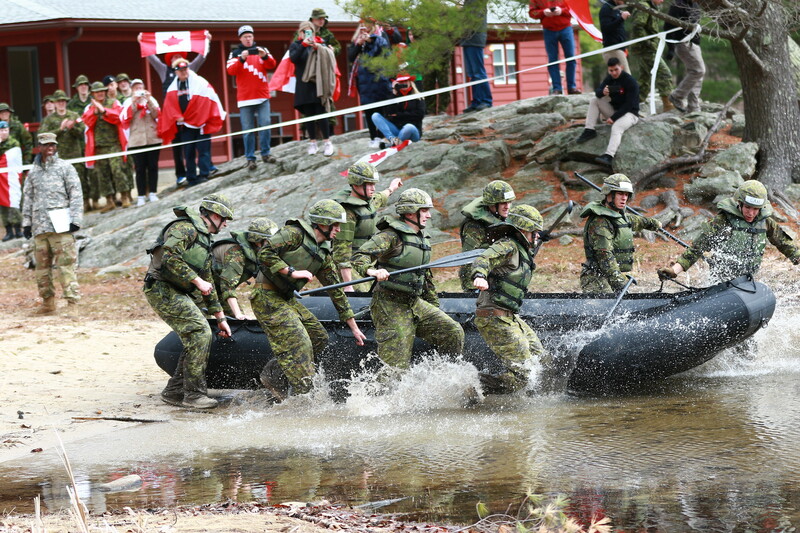 By the end of the competition, RMC had placed 8th overall in a pool of about 50 teams. I hope I speak for everyone when I say that the College is very proud of what the team managed to accomplish over the course of the weekend. The conditions were rather harsh and the air was everything but warm. Despite the challenges and obstacles (both mental and physical) that the team faced, they continued to push on. It was inspiring in every meaning of the word. It’s exciting to see where the Team plans on going from here. The Sandhurst Team would like to thank the RMC Foundation for their continued support. The 1 Canadian Parachute Battallion Association began with a $20 000 donation in 2006 and over ten years the Class of 1964 have contributed $125 000 as well. All photos courtesy of the RMC Photo Club. For LOTS more photos please click here. For more on the team and previous competitions please click here. What a terrific showing by the RMC team! Just excellent totally top drawer! You fellows really represent the college so well and I know we’re all very proud of the effort and the work that you did and accomplishing is great task! Well well done! You oh make us feel so honored by what you have put yourselves through and accomplished! You all are a real credit to the Royal Military College’S history and strong tradition. Respect and love to you all!